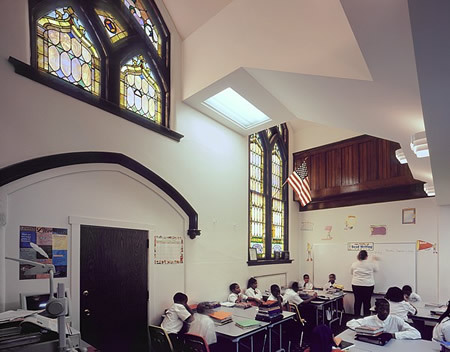 When Richard Allen first obtained this old church, they weren’t sure how it could be transformed into a series of classrooms where students and teachers could work together. TAG recognized the need to maintain the historical details and character of the space, while subdividing it into an educational village for children. The dividing partitions were spaced around the beautiful stained glass windows. The wooden choir loft was left in place and serves as a glorious overlook down the central core. The dark wood trim, cathedral ceilings, and original pendant mounted luminaires reflect back to a time when the hymns were still being sung and the organ was playing.